King of Persia from 521 to 485 B.C. ; son of Hystaspes. The sources for the history of Darius are his own trilingual inscription at Behistun, the Babylonian contract tablets, and the accounts which the Greeks from Herodotus onward have given. Herodotus is corrected repeatedly by Ctesias. The older branch of the Achæmenides died out with Cambyses and his brother, the true Smerdis, while the head of the younger branch, which traced its descent to Teispes, was Hystaspes, governor of Parthia, who submitted to the new ruler. His son Darius, however, undertook to win back the scepter from the Magian Gaumata, who had assumed the title of king and had married Cyrus' daughter. Darius and six intimate companions of noble blood, relying on the protection of Ahuramazda, attacked the usurper on the 10th of Tishri (Oct. 16), 521, at a city in Media, and killed him; Darius now became king. In Persia itself Darius was confronted by a new pretender, a second pseudo-Smerdis. In addition, the subject nations throughout the East (for instance, the Elamites, Medians, Parthians, Hyrkauians) tried to win back their independence, and placed at their head men who claimed descent from the royal family. The most serious rebellion was the one in Babylon under Nidintabel, who called himself Nebuchadnezzar III., the son of Nabonid. The first Babylonian record of Nebuchadnezzar III. 's reign is dated Tishri 17 (Oct. 23) of the year of his accession, 521. 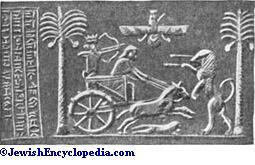 Darius besieged Babylon and sent capable generals against the other usurpers. In Jan. or Feb., 520, Babylon yielded, and Darius was free to personally direct the crushing of the Median revolt. But in the spring Babylon rebelled again under the Armenian Arakha, who also pretended to be Nebuchadnezzar, son of Nabonid. There are many records dated in Darius' reign. At the beginning of 519 Babylon was retaken by Vidafra; and by the summer of 519 Darius had authority over the whole of the empire. These events directly concerned the Jews, who thought they presaged the great crisis, the self-annihilation of the heathen kingdom, which, according to Ezekiel, was to precede the Messianic era. But the Jews entertained no idea of rebelling: they were too thoroughly imbued with the teaching of the Prophets that it was wicked to forestall the ways of God. Nevertheless, they looked upon Zerubbabel, of the house of David, who, as the Persian governor, was the head of the little province of Judea, as the coming Messiah. It was fit then that they should make preparations, since God Himself was evidently preparing. Consequently, on the first day of the sixth month, in the second year of the reign of Darius, the prophet Haggai announced to Zerubbabel that the time was ripe, and the high priest Joshua began the rebuilding of the Temple. On the 24th of the ninth month (Dec. 17), 520, the foundation-stone of the Temple was laid. The prophet Zechariah supported Haggai and encouraged the people, even when news came of the continuous victories of the Persians. As late as the 24th of the eleventh month (Jan. 13), 519, he had a crown made for Zerubbabel out of gold sent by Jews in Babylon. The hopes in the Messianic era were vain, for soon the Persian rule was more firmly established than ever. 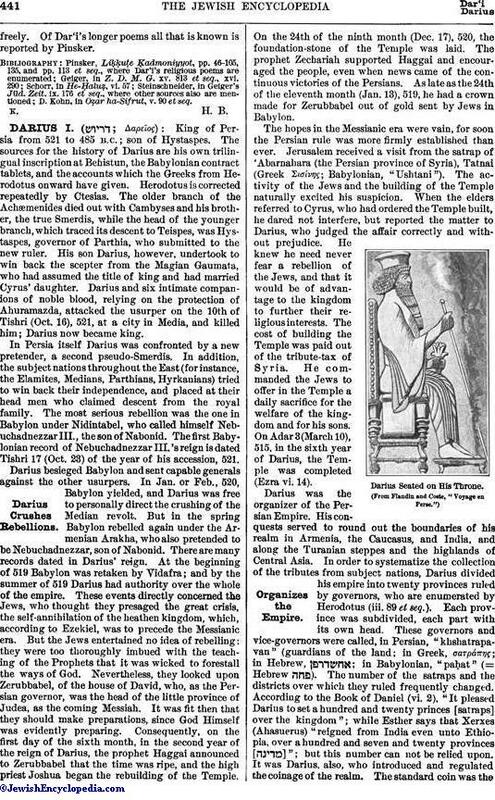 Jerusalem received a visit from the satrap of 'Abarnahara (the Persian province of Syria), Tatnai (Greek Σισίνης; Babylonian, "Ushtani"). The activity of the Jews and the building of the Temple naturally excited his suspicion. When the elders referred to Cyrus, who had ordered the Temple built, he dared not interfere, but reported the matter to Darius, who judged the affair correctly and without prejudice. He knew he need never fear a rebellion of the Jews, and that it would be of advantage to the kingdom to further their religiousinterests. The cost of building the Temple was paid out of the tribute-tax of Syria. He commanded the Jews to offer in the Temple a daily sacrifice for the welfare of the kingdom and for his sons. On Adar 3 (March 10), 515, in the sixth year of Darius, the Temple was completed (Ezra vi. 14). Darius Seated on His Throne. Darius was the organizer of the Persian Empire. His conquests served to round out the boundaries of his realm in Armenia, the Caucasus, and India, and along the Turanian steppes and the highlands of Central Asia. In order to systematize the collection of the tributes from subject nations, Darius divided his empire into twenty provinces ruled by governors, who are enumerated by Herodotus (iii. 89 et seq.). Each province was subdivided, each part with its own head. These governors and vice-governors were called, in Persian, "khshatrapavan" (guardians of the land; in Greek, σατράπης; in Hebrew, ; in Babylonian, "paḥat" (= Hebrew ). The number of the satraps and the districts over which they ruled frequently changed. According to the Book of Daniel (vi. 2), "It pleased Darius to set a hundred and twenty princes [satraps] over the kingdom"; while Esther says that Xerxes (Ahasuerus) "reigned from India even unto Ethiopia, over a hundred and seven and twenty provinces [ ]"; but this number can not be relied upon. It was Darius, also, who introduced and regulated the coinage of the realm. The standard coin was thegolden daric (Hebrew and Phenician , to be distinguished from , "drachma"), weighing 8.4 grams = 130 grains, and in silver worth 20 shekels, each 5.6 grams = 86.5 grains; 100 shekels, or 5 darics, made a silver mina; and 6,000 shekels, or 300 darics, made a silver talent. 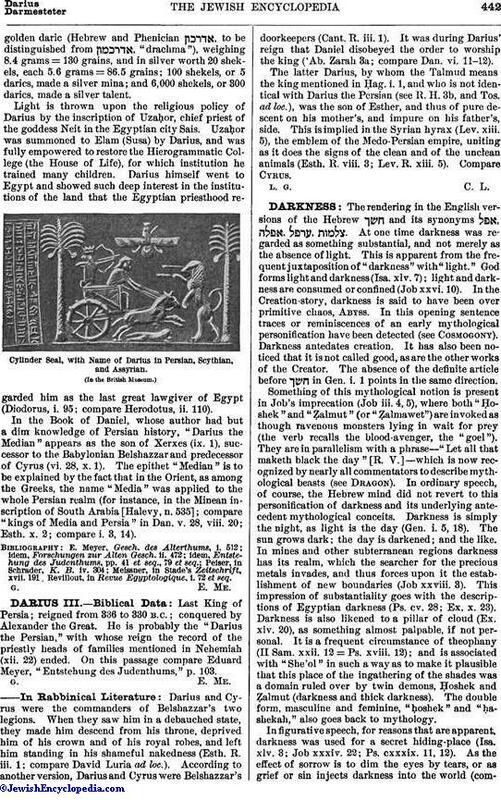 Light is thrown upon the religious policy of Darius by the inscription of Uzaḥor, chief priest of the goddess Neit in the Egyptian city Sais. Uzaḥor was summoned to Elam (Susa) by Darius, and was fully empowered to restore the Hierogrammatic College (the House of Life), for which institution he trained many children. Darius himself went to Egypt and showed such deep interest in the institutions of the land that the Egyptian priesthood regarded him as the last great lawgiver of Egypt (Diodorus, i. 95; compare Herodotus, ii. 110). Cylinder Seal, with Name of Darius in Persian, Scythian, and Assyrian. In the Book of Daniel, whose author had but a dim knowledge of Persian history, "Darius the Median" appears as the son of Xerxes (ix. 1), successor to the Babylonian Belshazzar and predecessor of Cyrus (vi. 28, x. 1). The epithet "Median" is to be explained by the fact that in the Orient, as among the Greeks, the name "Media" was applied to the whole Persian realm (for instance, in the Minean inscription of South Arabia [Halevy, n. 535]; compare "kings of Media and Persia" in Dan. v. 28, viii. 20; Esth. x. 2; compare i. 3, 14). Meissner, in Stade's Zeitschrift, xvii. 191. Revillout, in Revue Egyptologique, i. 72 et seq.